"Face of SWE-ECI"-provides strong direction, clear communication goals, and energizes CB (core board) and the section with enthusiasm. Approves and sends out newsletter. "President in training" - plans on taking on the role of President the following year. Contributes strong ideas; demonstrates support and enthusiasm. Money keeper - safe keeper of all financial activity and SWE assets; keeps tabs on funds status and money related interfaces. Drafts the fiscal year budget w/ the president and vice president for review by the Core Board. Voice of SWE-ECI - Assembles and sends out monthly newsletter and maintains SWE-ECI website. Liaison with Region H leaders and SWE HQ- knowledgable and/or interested in SWE's larger network, proactive communicator. Marketer and Social Media Guru - guides the "image of SWE", has an eye for marketing, skilled at getting information out quickly in a way that gains interest; channels enthusiasm via communication tools. Markets each event at least 2 weeks prior on Facebook, Twitter, & Linked In by posting event details. 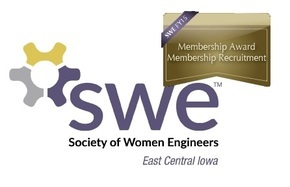 Recruiter - outgoing, understands SWE's value and enthusiastically talks about it with others, seeks out ways to/interested in how to increase membership and involvement. STEM Go-To – passion for STEM and outreach, creative, proactive communicator within SWE and out of SWE to STEM connections; positive and persistent! Guides Co-Chair and committee members. University of Iowa Liaison – familiar with University of Iowa SWE, approachable and supportive; a positive role model and proactive communicator. YES! No, but I will send my blurb to swe-eci@swe.org!